"Skin has become inadequate in interfacing with reality. Technology has become the body's new membrane of existence." 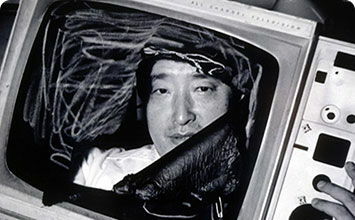 Nam June Paik, known as "the father of video art," surfed the forefront of cutting edge technologies and utilized them to realize artworks, the likes the world had never yet seen. His various experiments positioned video as a viable art form, and a tool toward accomplishing widespread, global connectivity - an oeuvre eerily prophetic to our contemporary information age. His revolutionary practice laid the groundwork for today's artists working in new media art. Paik's early training in classical music combined with his interest in utilizing sound elements from real life, inspired by artist John Cage, positioned his career early as a member of the Fluxus movement. His passion for combining audio, visual, and electronic elements was formed there. A keen desire to humanize technology underlies all of Paik's work. Whether this is seen through the combination of anthropomorphic objects with video imagery of human beings, the use of a live person in dialogue with technological components, or equipment as a performance, or the forced interaction of a viewer with a particular artwork - his work incites reflection on both our relationship with technology and its affects on, and benefits for, modern man. Very early in his career, Paik began writing about his desire for a "video common market" that would allow for the free dissemination of not only artwork, but also education, collaboration, and dialogue on an international scale. His ideas have come full circle with the advent of today's Facebooks and Youtubes - the online platforms that draw users by the billions. Paik coined the term "electronic superhighway" to denote what he saw as a future in which technology would allow for boundary-less connection between people on a global scale. His term might be considered the first mention of the concept that would eventually become manifest in the Internet, and is in fact, the term used universally today. 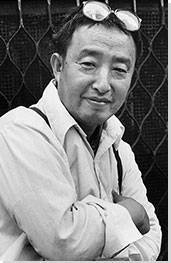 Nam June Paik was born into a bourgeois manufacturing family in 1932 Seoul, during a turbulent time when Korea was under Japanese rule (1910-1945). Whereas most Koreans were only granted access to a primary school education under restrictions by the Japanese, Paik was trained as a classical pianist from a very young age. Perhaps this was due to the fact that his father was later rumored to be a Chinilpa, or Japanese sympathizer, whose successful business also contributed greatly to the economic capital of the time. In 1950 at the onset of the Korean War, Paik's family fled to Hong Kong, and later moved to Japan. They first arrived in the port city of Kobe and stayed at a Japanese inn for six months before they settled into a Western-style house, a rarity in those days. The house was in the seaside town of Kamakura, home of the famous Great Buddha statue that Paik often visited and which possibly inspired some of his later works, such as TV Buddha (1974). Interactive chart with Nam June Paik's main influences, and the people and ideas that the artist influenced in turn. First published on 22 Dec 2017. Updated and modified regularly.